The 27.1 metre motor yacht Day Off has changed central agencies and is now listed for sale by Alexander Vaal at Fraser in Monaco. 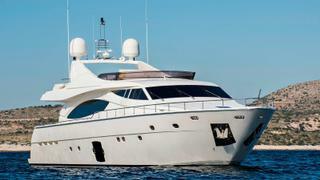 Built in GRP by Italian yard Ferretti to a design by Zuccon International, she was delivered in 2006, RINA classed and the flagship of the yard’s Ferretti 881 model. Accommodation is for eight guests in four cabins consisting of a master suite amidships, a VIP suite and port and starboard twins, all with marble floored en suite bathroom facilities and LCD televisions. The expansive saloon is panelled in cherry wood and has comfortable seating along with an entertainment system including a 43 inch pop-up television. There is also a formal dining area forward and a large galley on this yacht for sale. Al fresco dining and entertaining is available on the aft deck, fitted with a large settee and table while more outdoor living comes on the flybridge, featuring a Jacuzzi, barbecue, bar, large sun pads and a hydraulic Bimini top. Twin 2,000hp MTU engines give her a cruising speed of 26 knots and a maximum speed of 30 knots. Lying in Athens, Greece, Day Off is asking €2,900,000 with VAT paid.